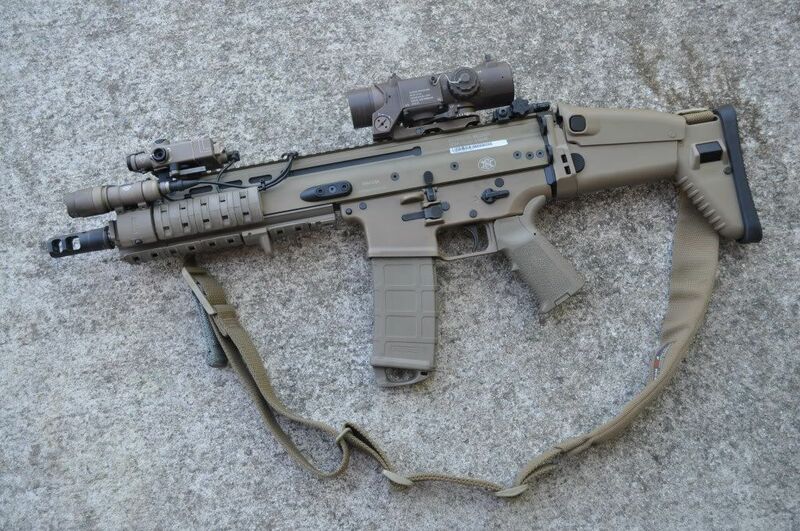 SCAR-H with short CQC barrel and EGLM 40 mm under barrel grenade launcher. 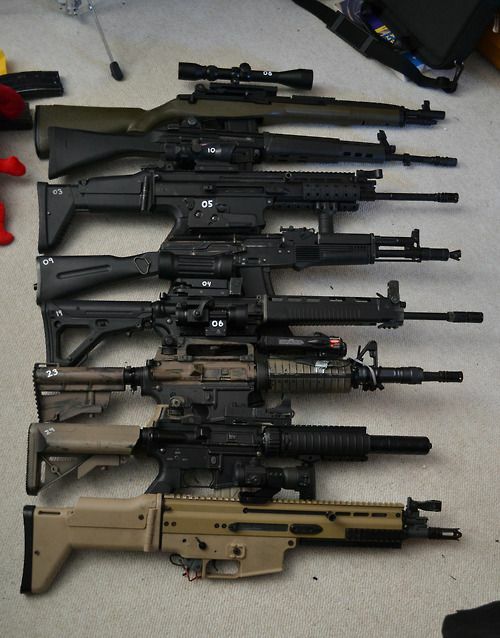 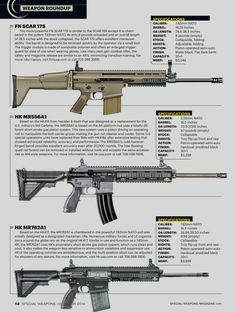 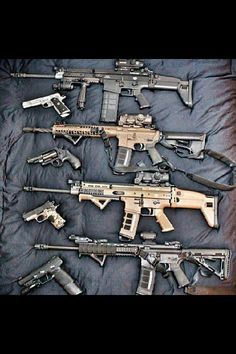 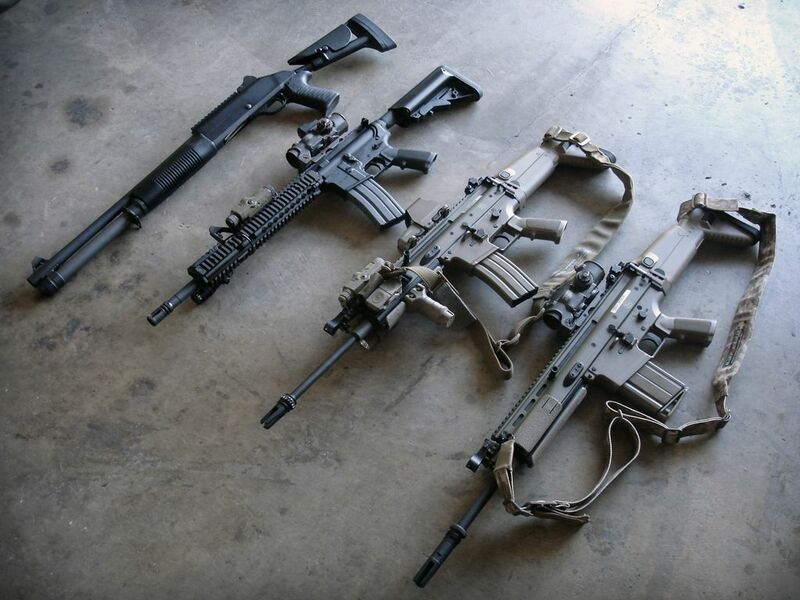 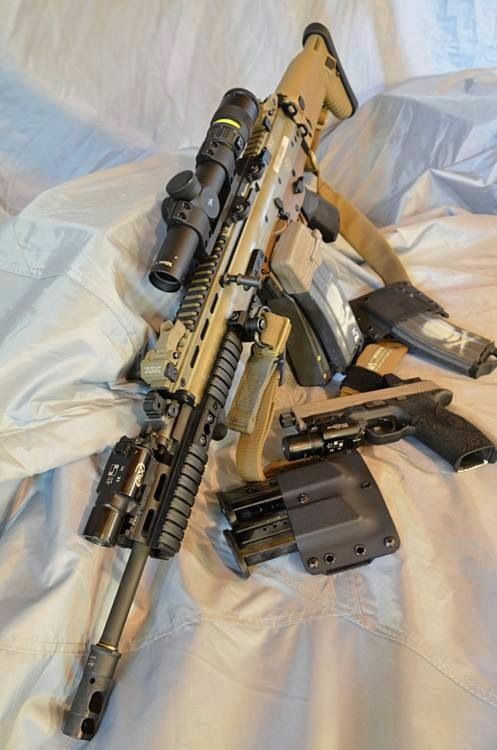 Springfield SOCOM 16, Howa Type 89, FN Mk.17 SCAR-H STD, Izhmash AK-105, 205th Armament T91, Colt M727, Griffin Armament M4-SD II, and FN Mk.16 SCAR-L CQC. 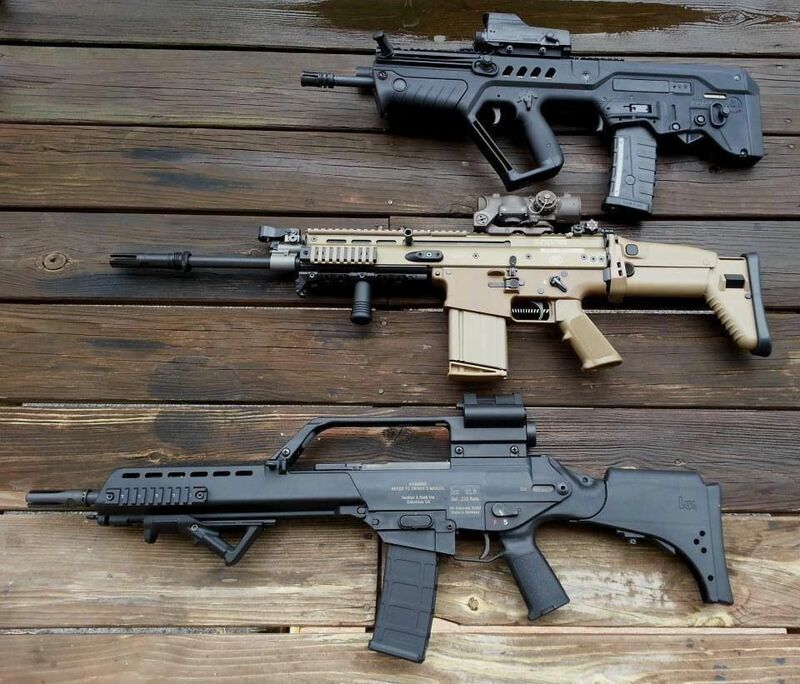 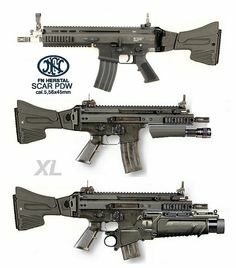 Looks like SCAR PDW (PDW = Personal Defense Weapon) with 6.75" barrel. 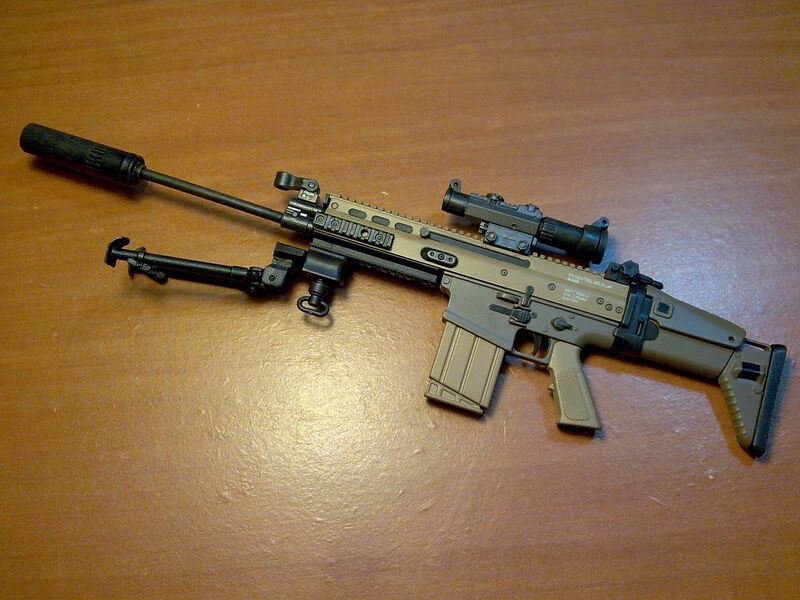 In 5.56mm only. 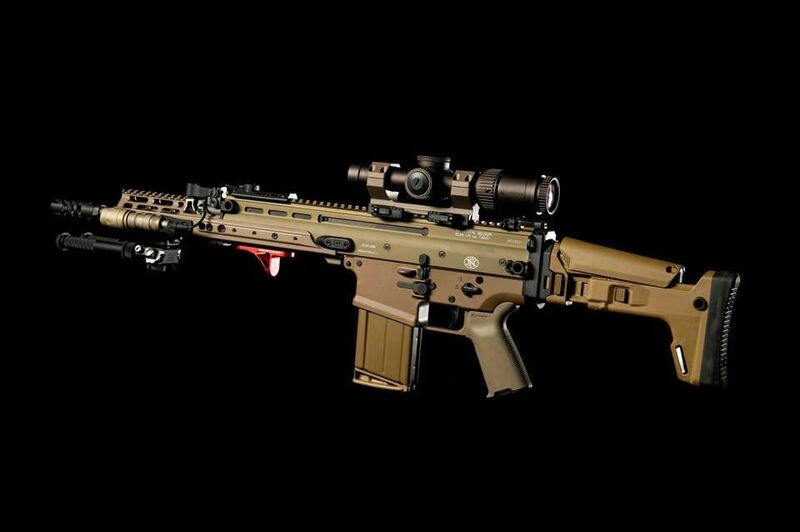 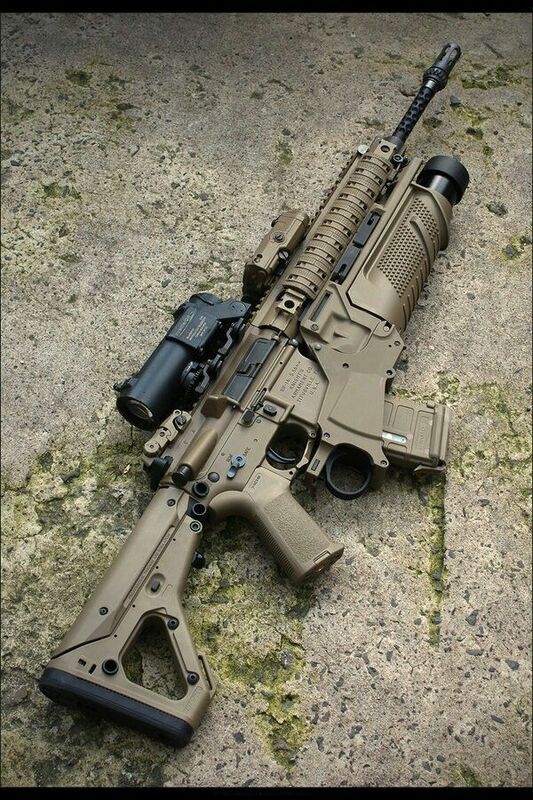 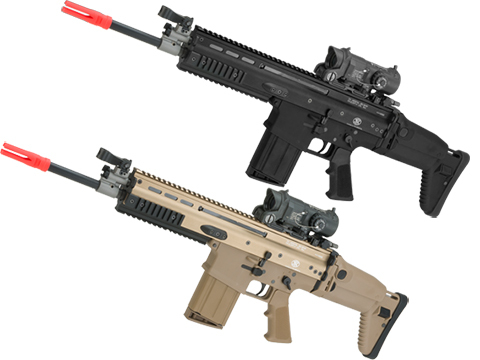 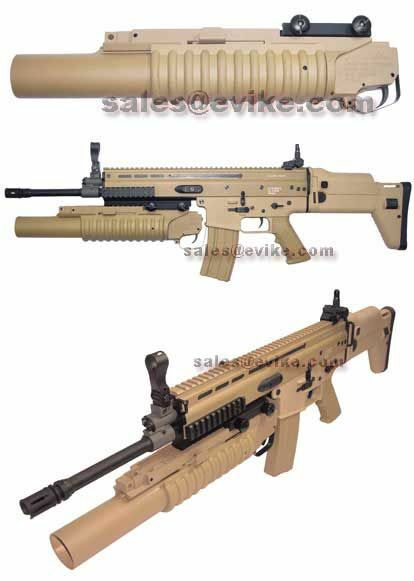 SCAR Mk 17 = SCAR-H = 7.62mm Has optical sight and bipod. 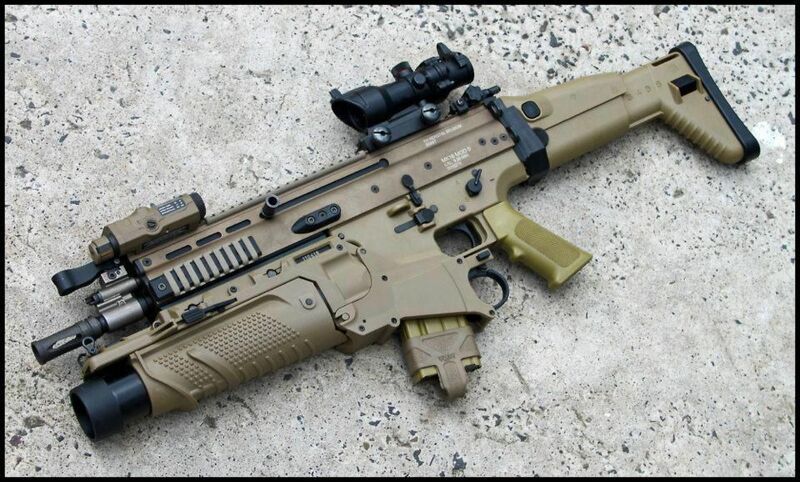 SCAR-H. CQC short barrel. 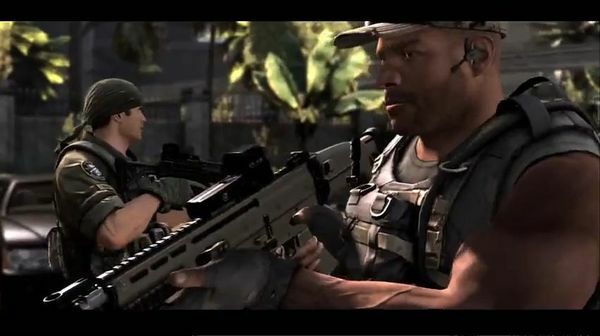 CQC = Close Quarters Combat. 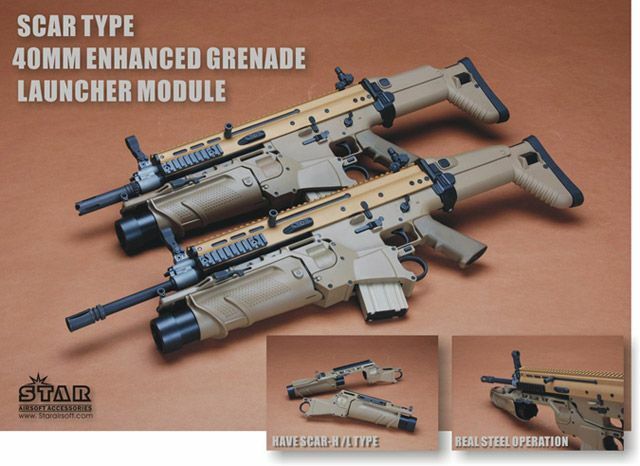 Has FN EGLM = Enhanced Grenade Launcher Module - a cutting edge 40mm grenade launcher. 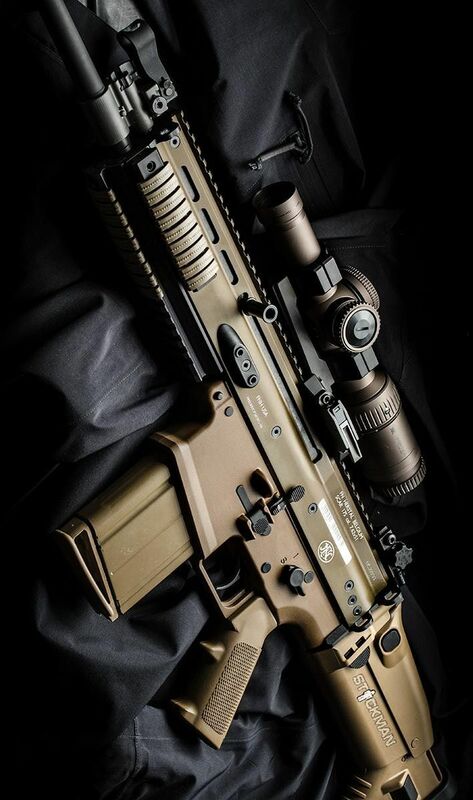 FN Herstal SCAR with Vortex Optics scope on an Arc'teryx LEAF Alpha jacket. 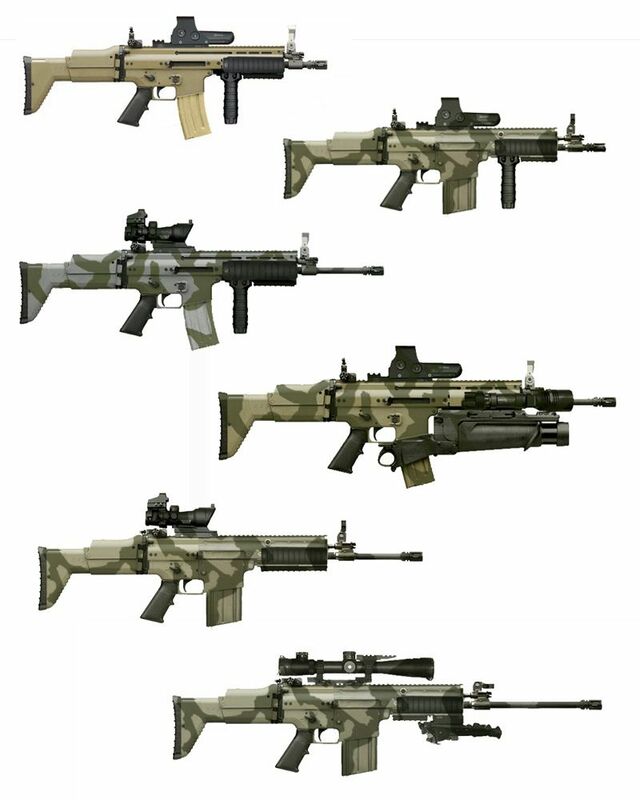 By Stickman. 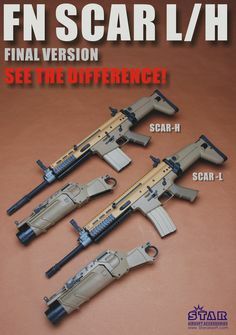 SCAR-H. 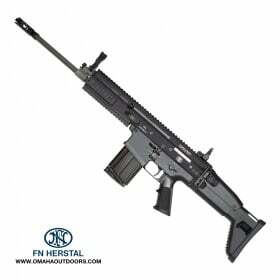 However, this is in black, which suggests civilian, but with an FN EGLM 40mm grenade launcher, which strikes me as not legal for civilians. 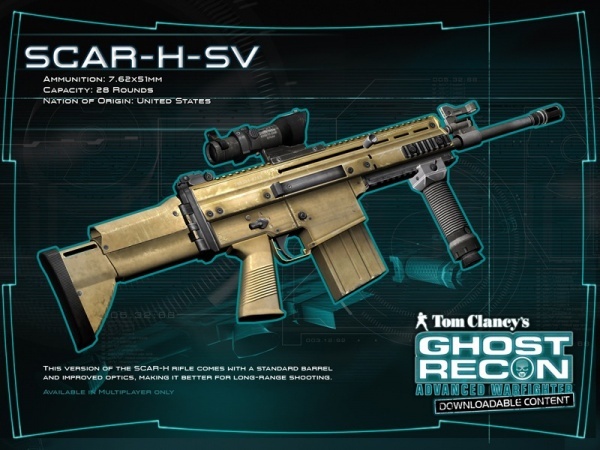 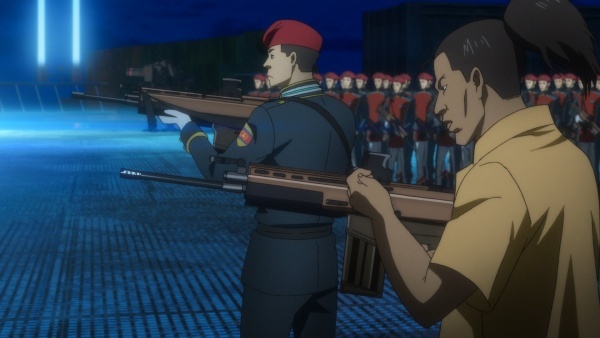 "SV" refers to "Sniper Variant", an other designation of the LB (Long Barrel) variant of the SCAR-L/H rifles. 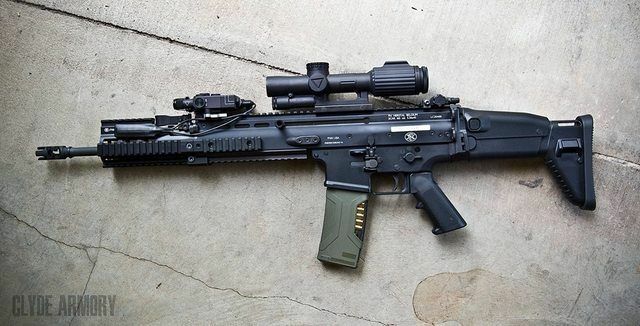 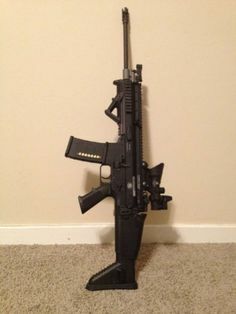 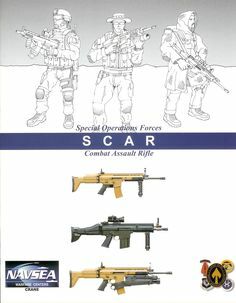 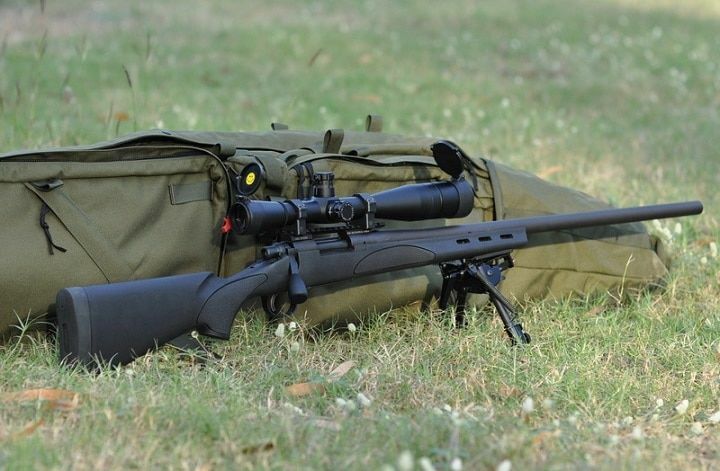 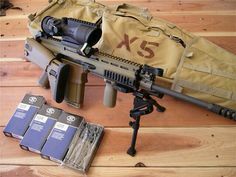 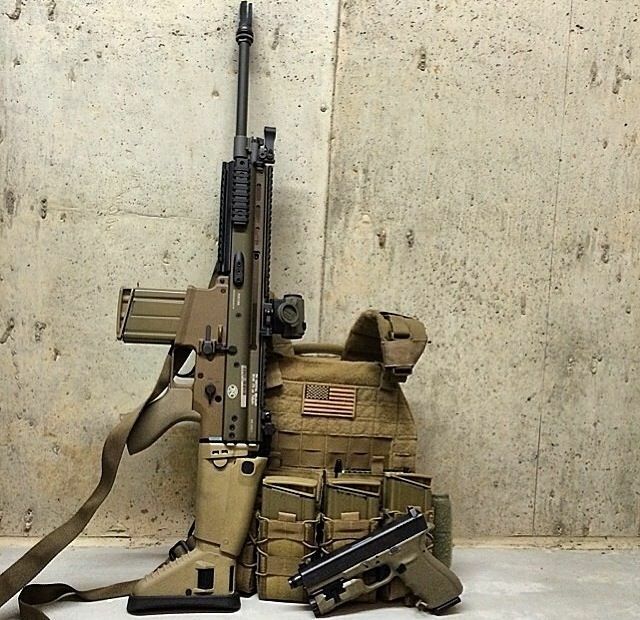 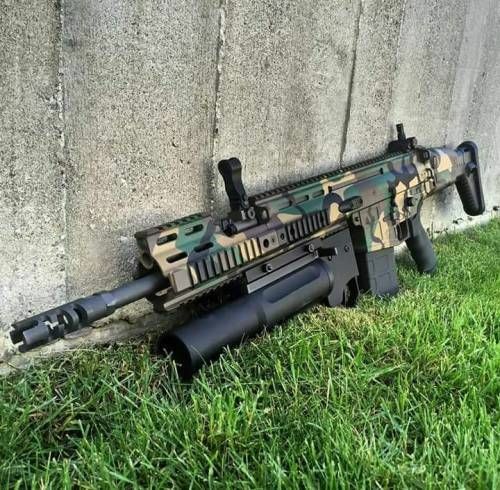 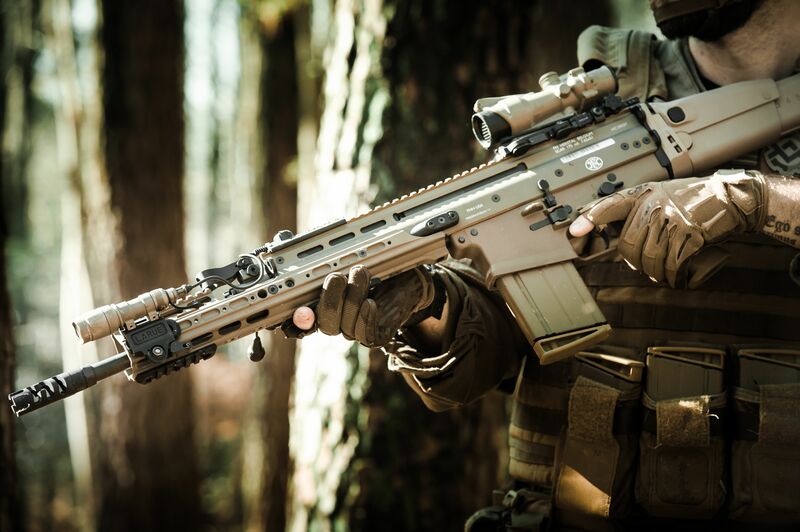 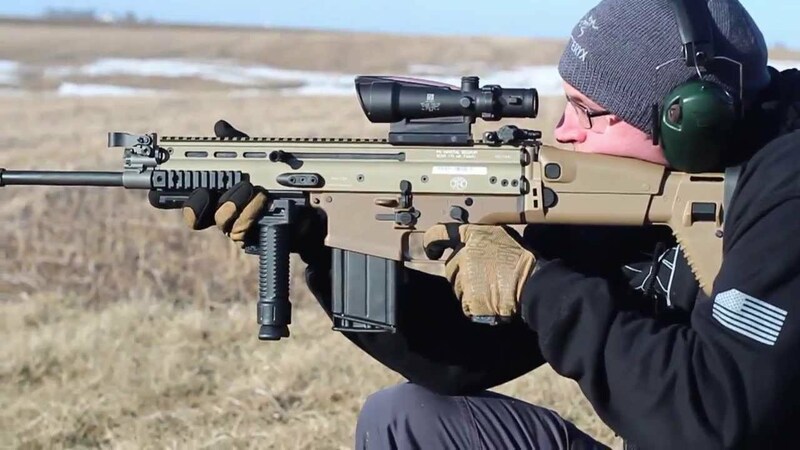 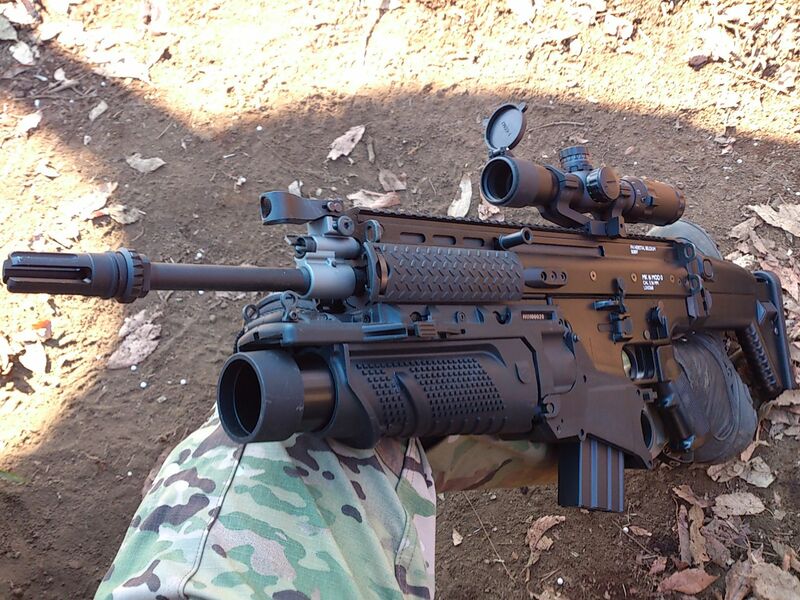 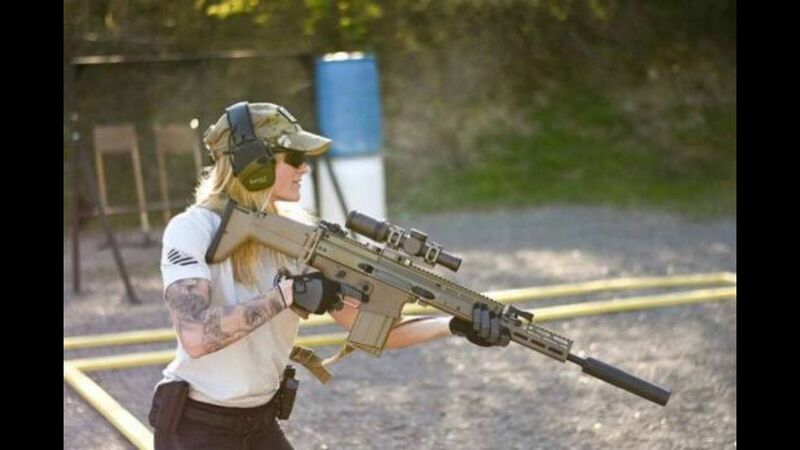 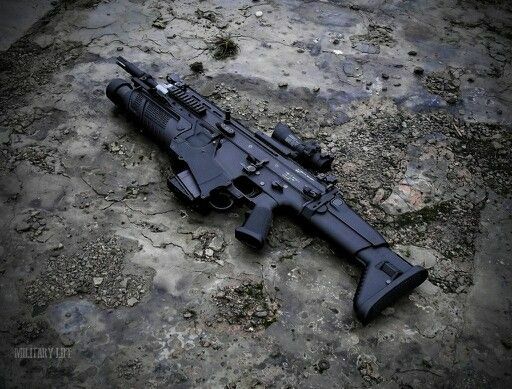 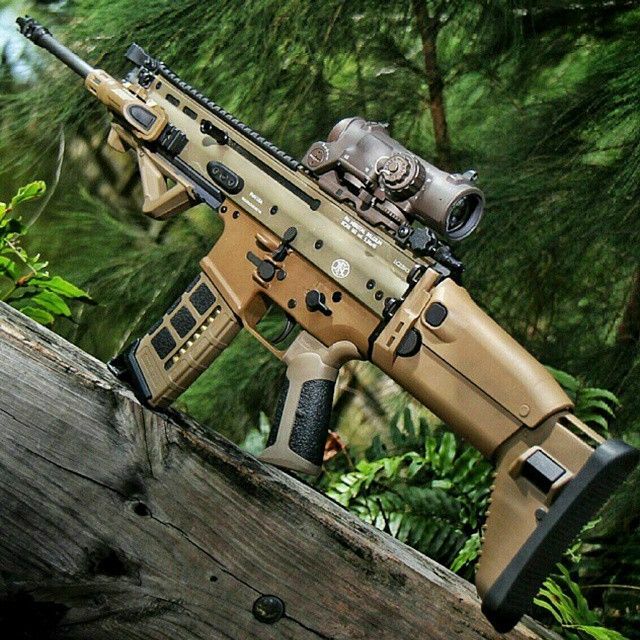 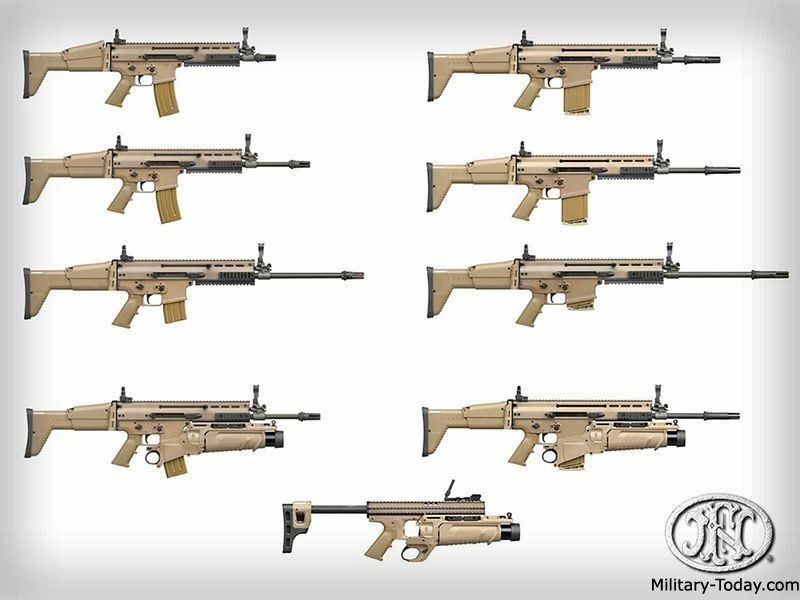 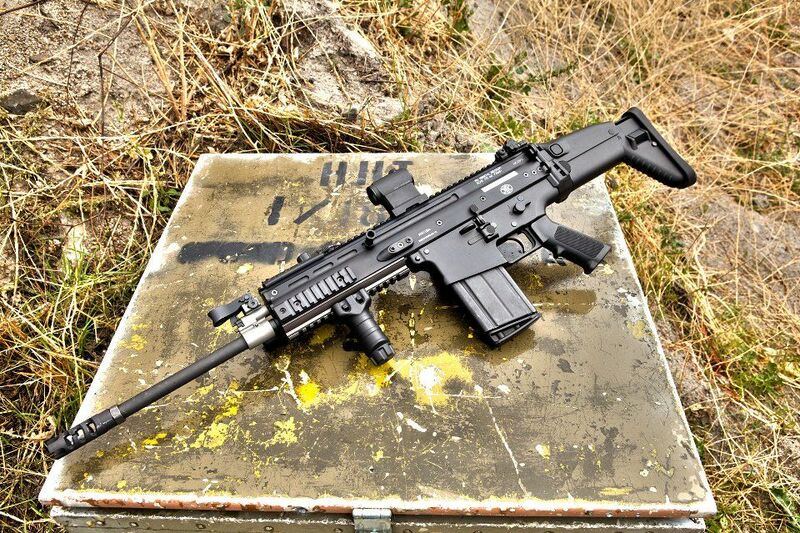 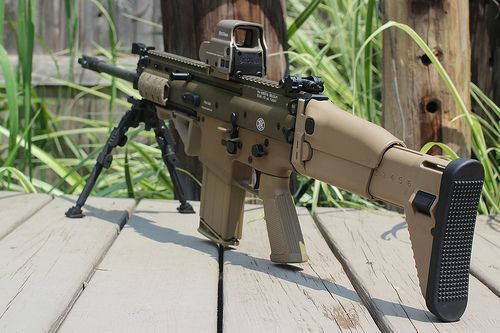 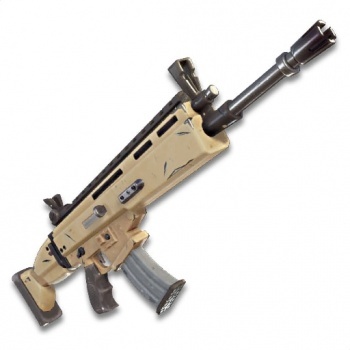 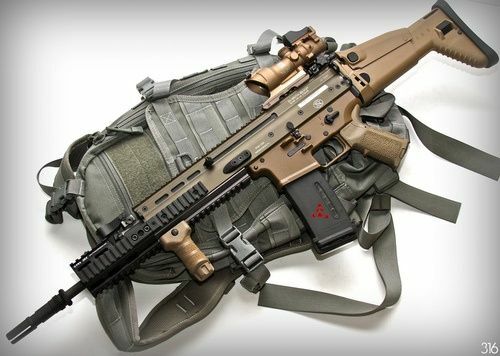 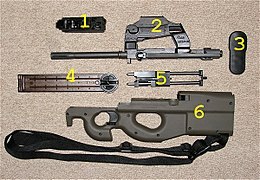 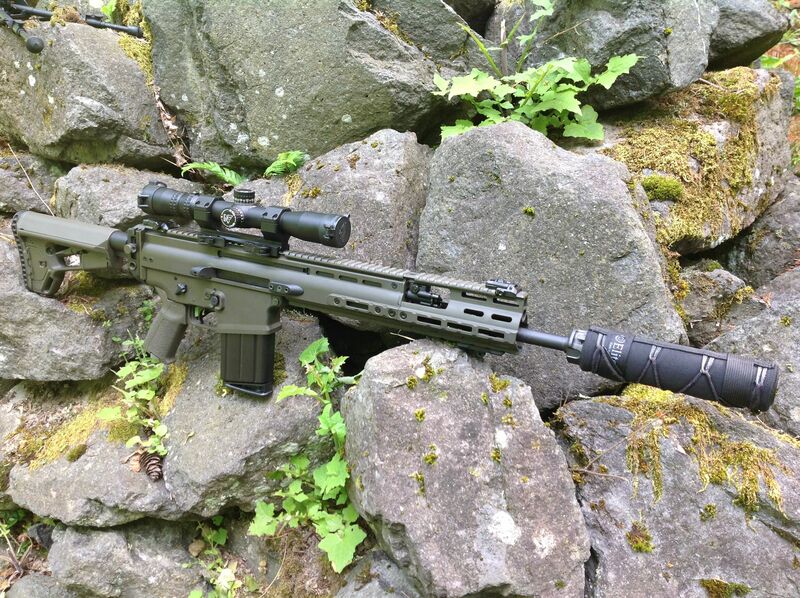 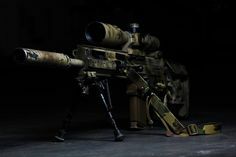 SCAR SSR. 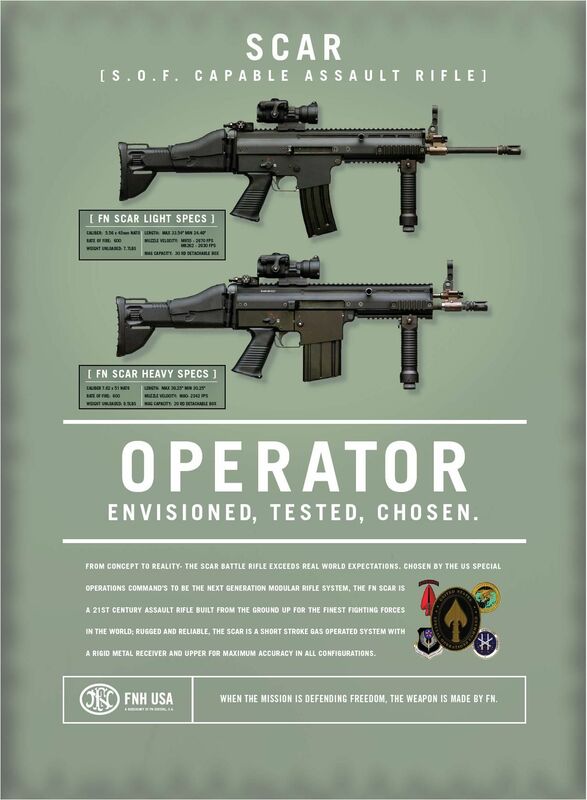 It is 7.62mm --- SOCOM designation is Mk 20. 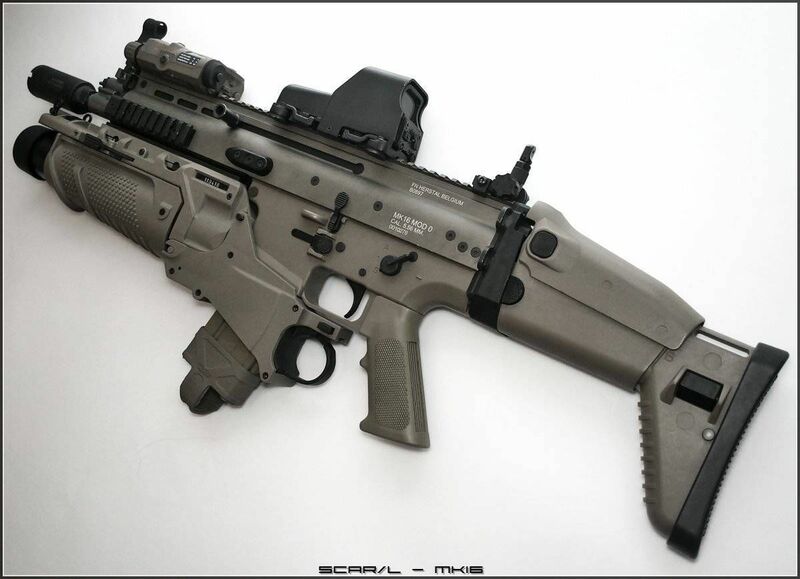 A henchman with a SCAR-L fitted with an airsoft M203 replica. 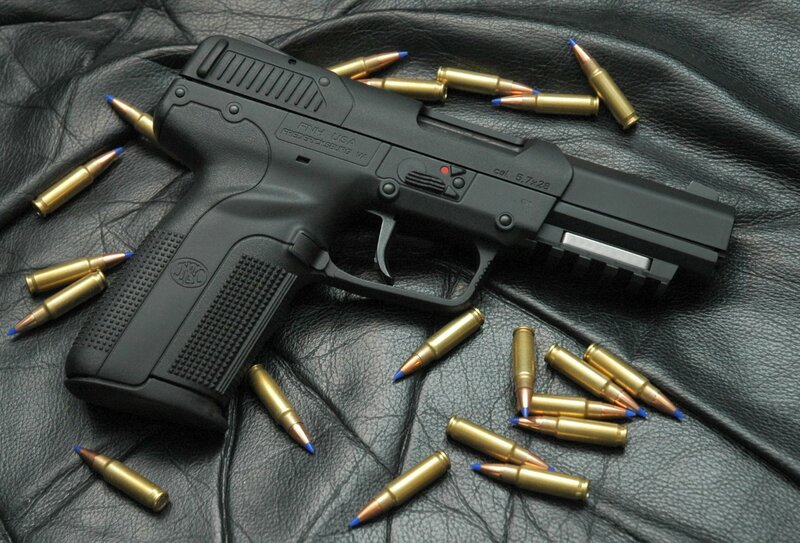 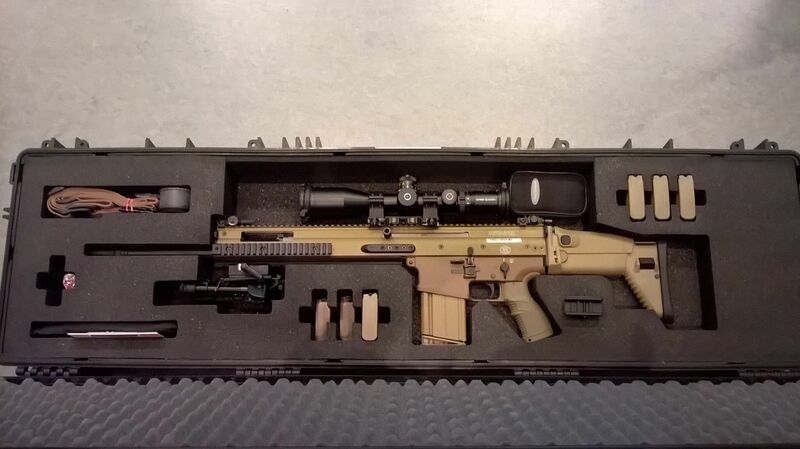 Note the lack of an inserted magazine. 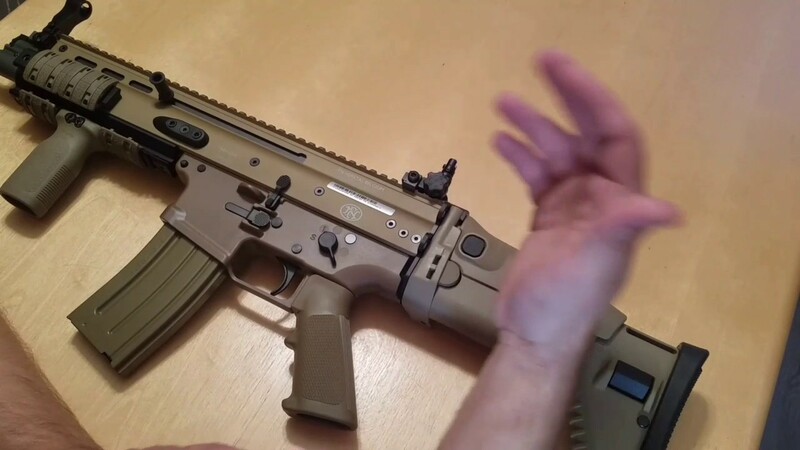 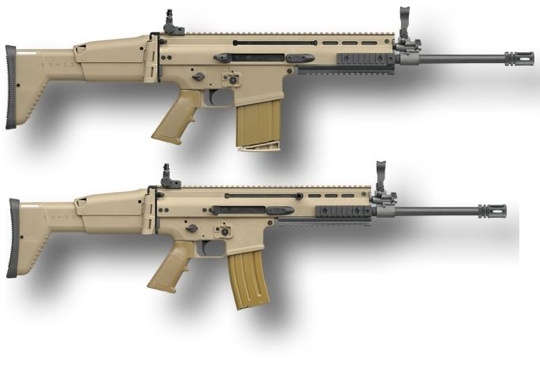 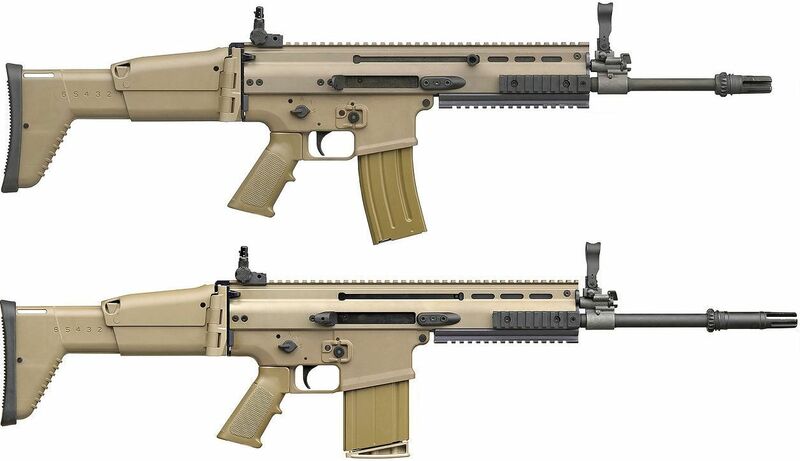 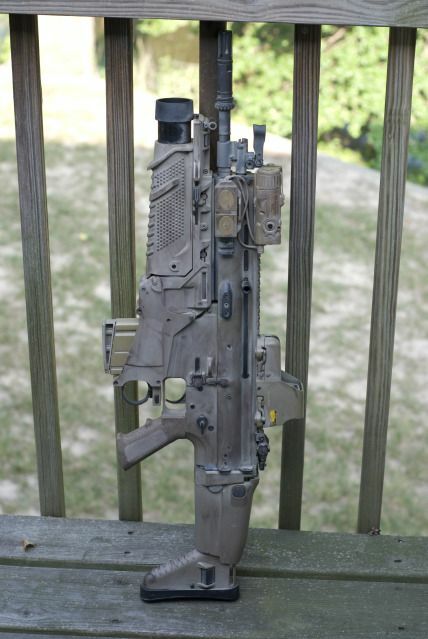 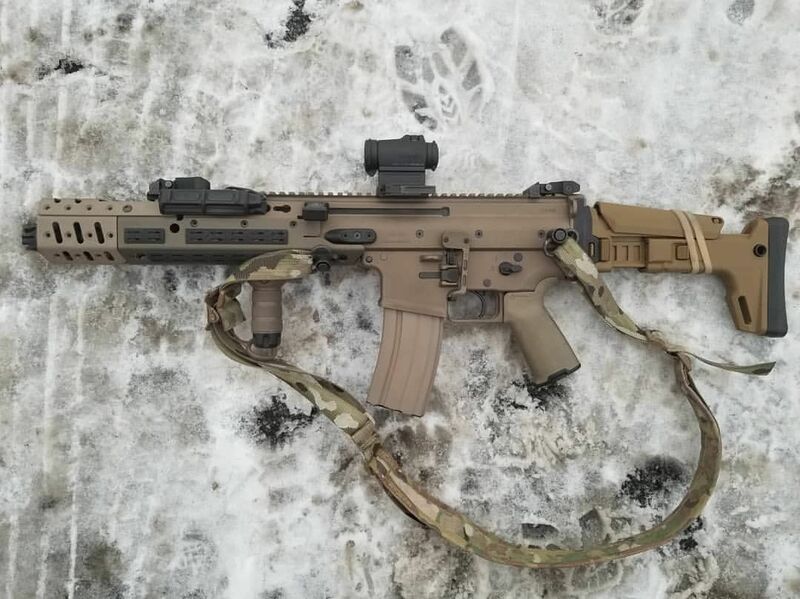 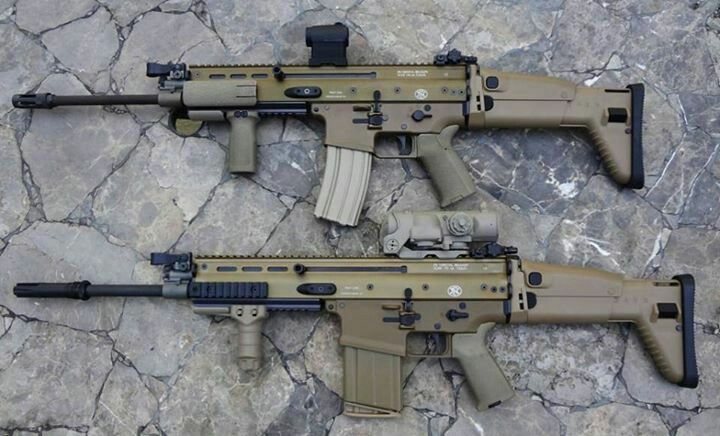 Third Generation FN SCAR-L - 5.56x45mm NATO. 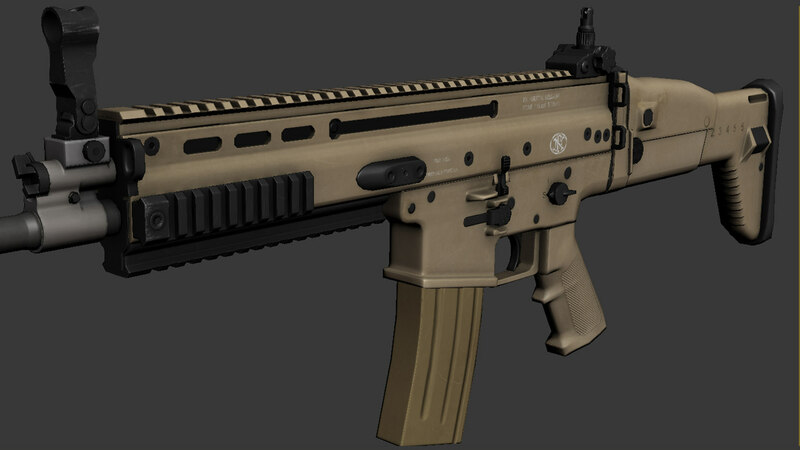 The Siegebreaker/Equalizer/Assault Rifle model. 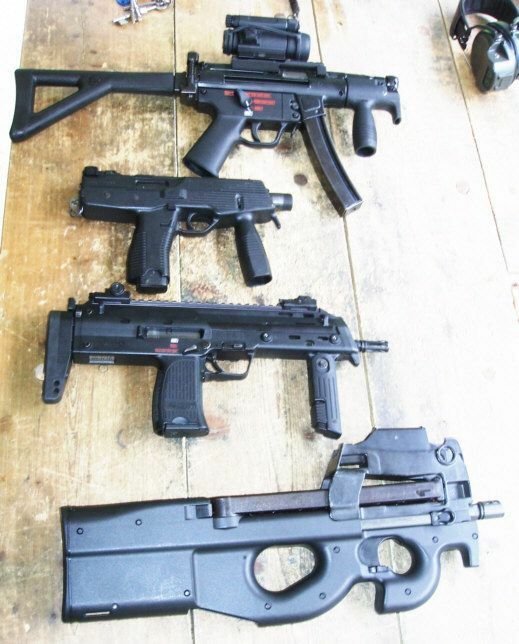 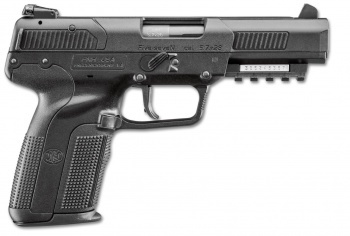 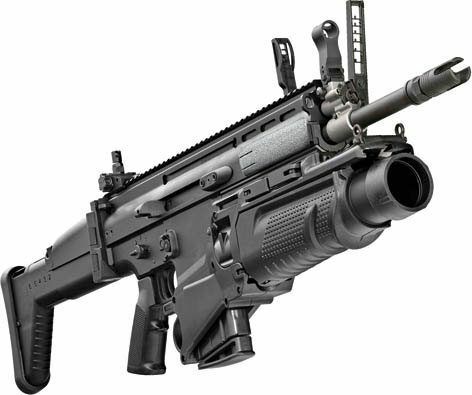 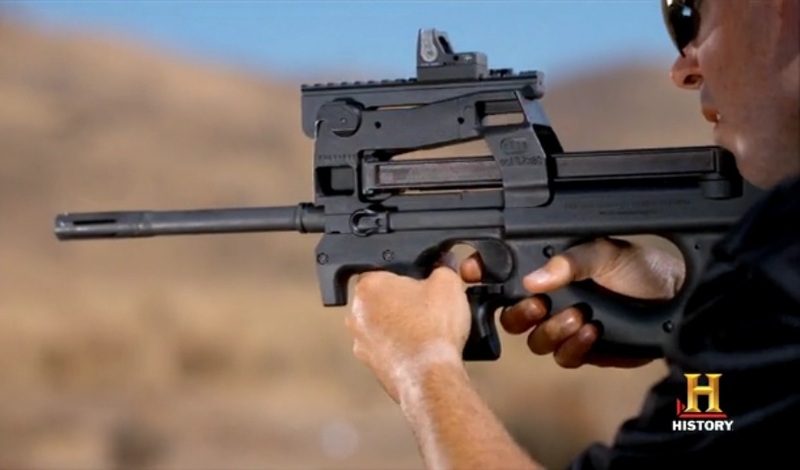 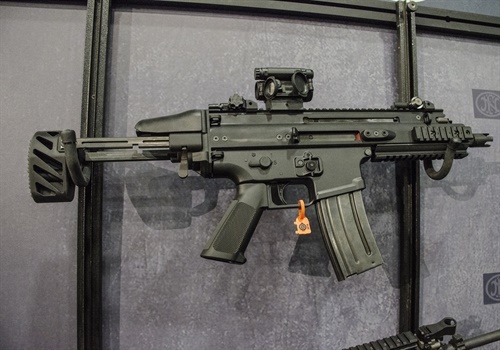 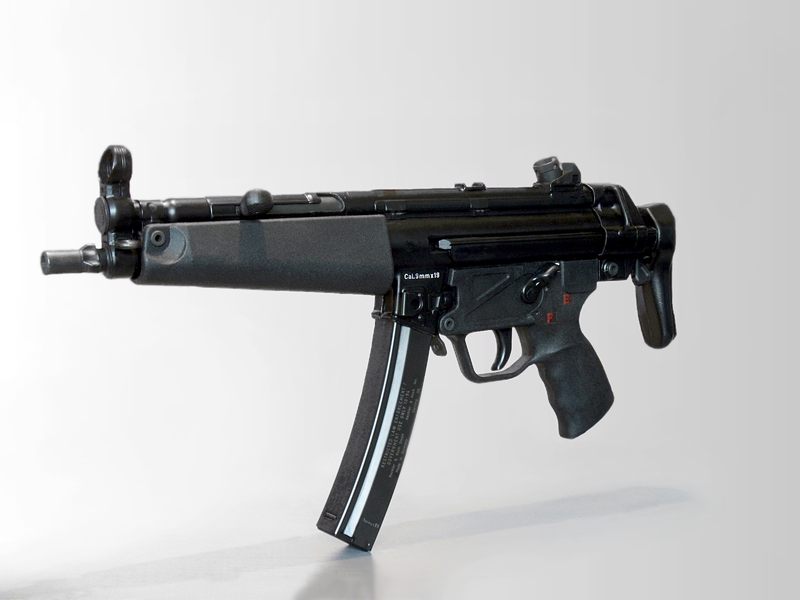 Heckler & Koch MP7A1 with Zeiss Z-Point red dot sight and 40-round magazine - 4.6x30mm. " 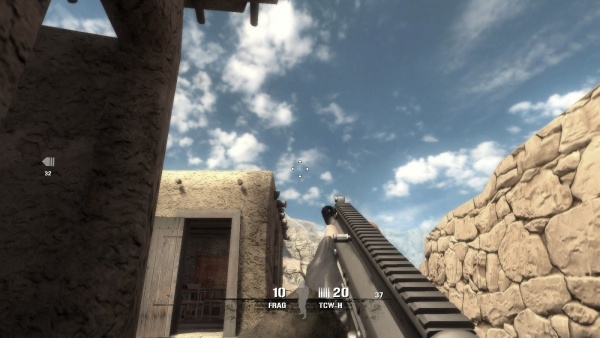 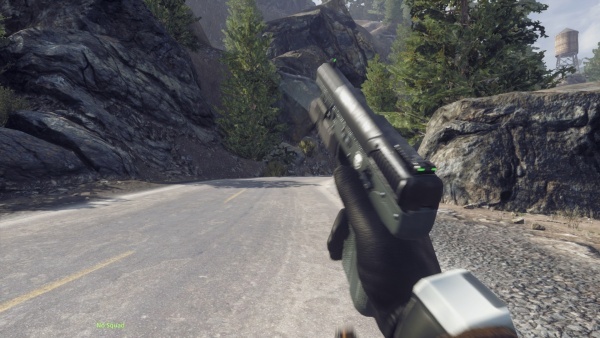 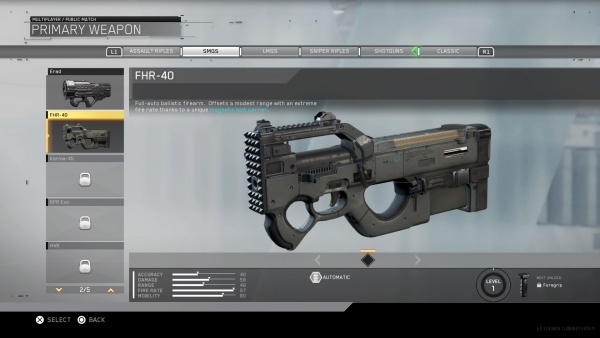 The "FHR-40" in the beta weapon selection menu. 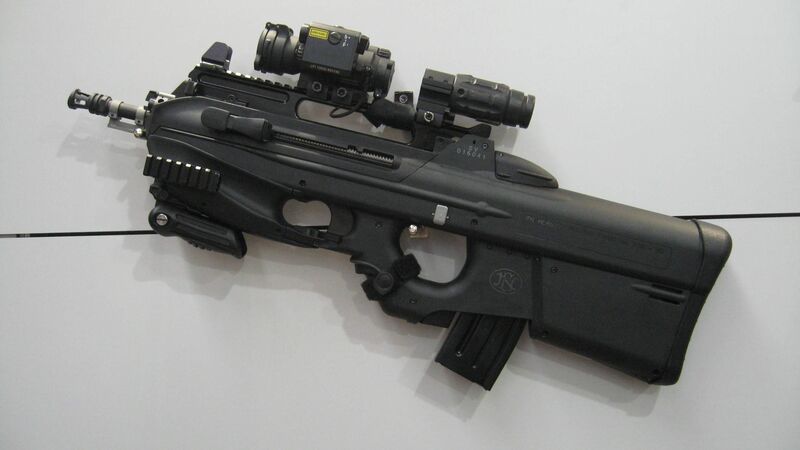 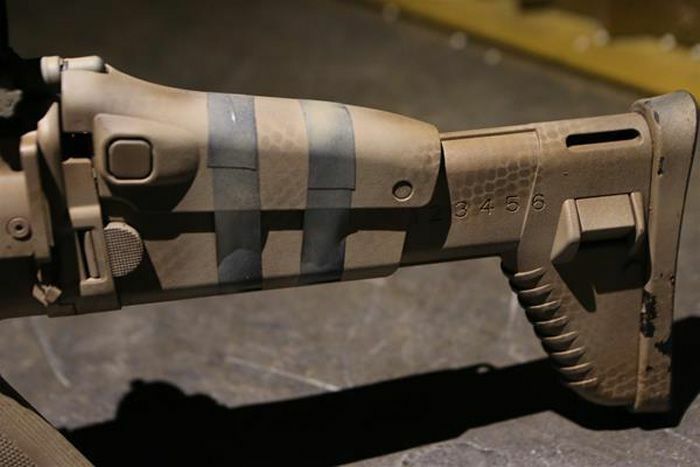 Note the Binary Domain-style striking muzzle that spans the entirety of the front of the weapon. 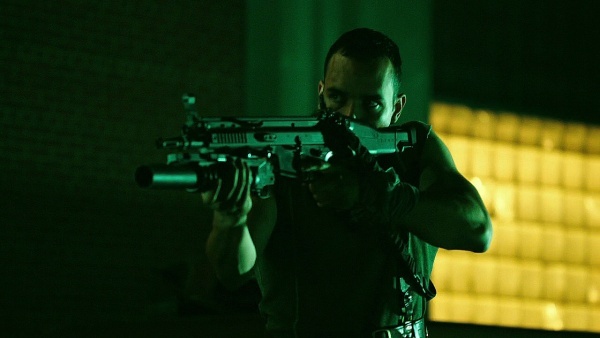 Bauer behind an FN SCAR-L rifle in season 8. 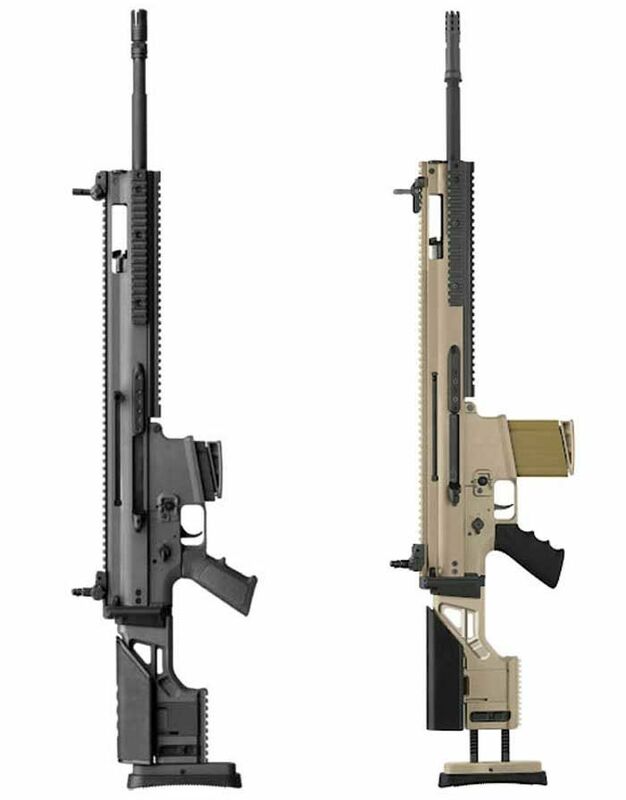 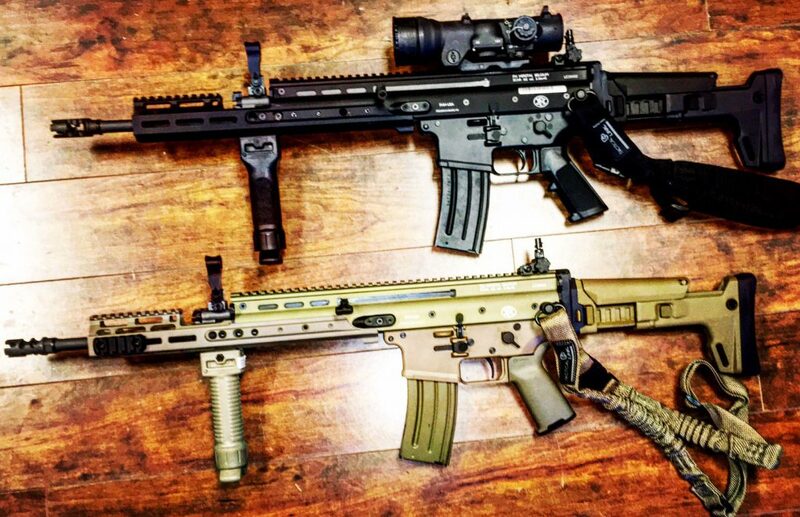 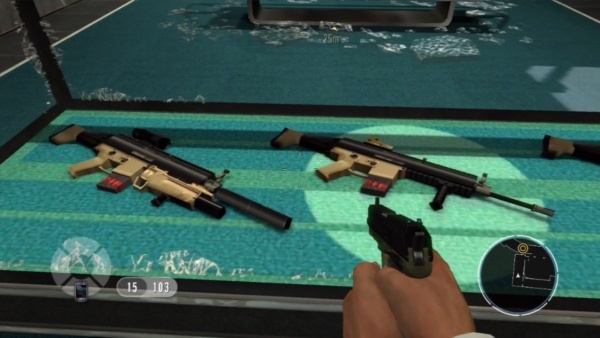 Top is SCAR-L and bottom is SCAR-H. 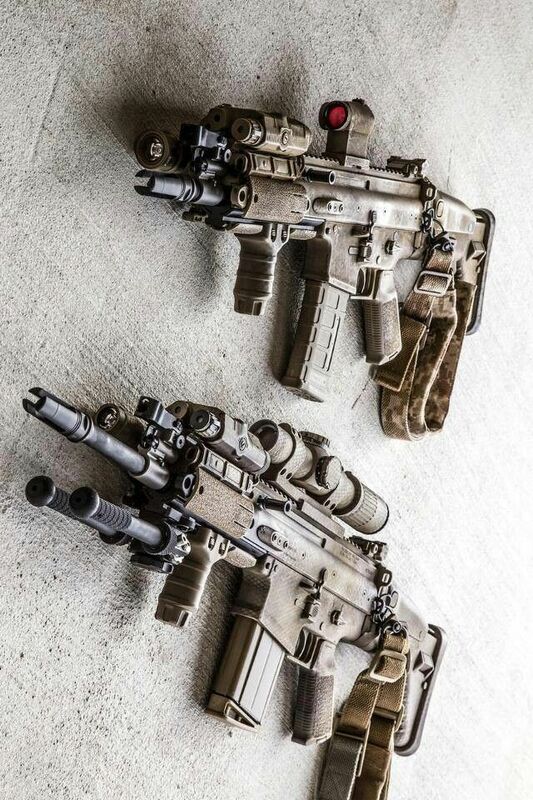 They have different accessories. 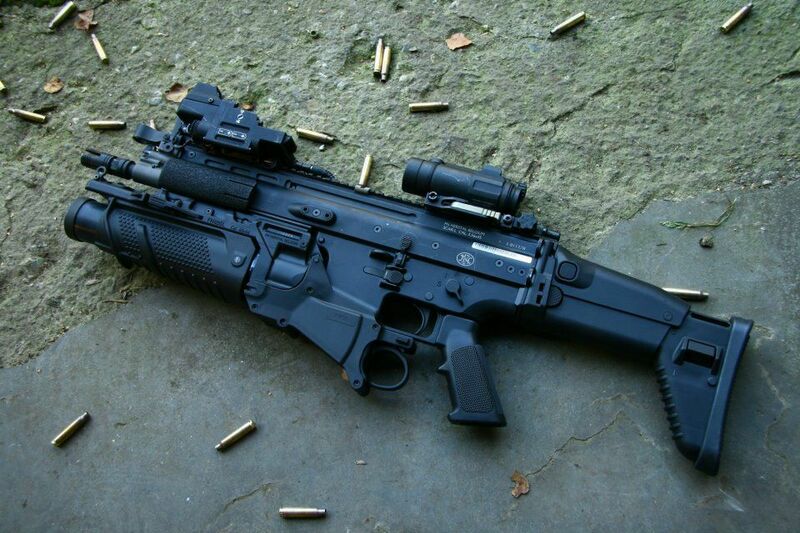 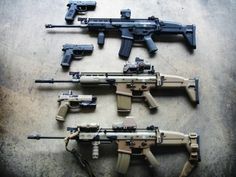 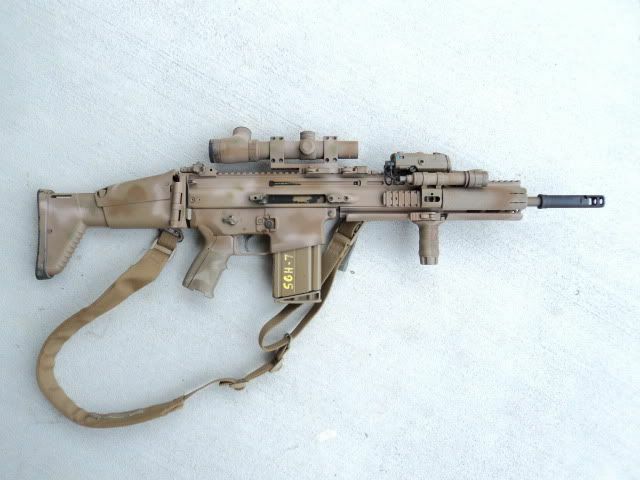 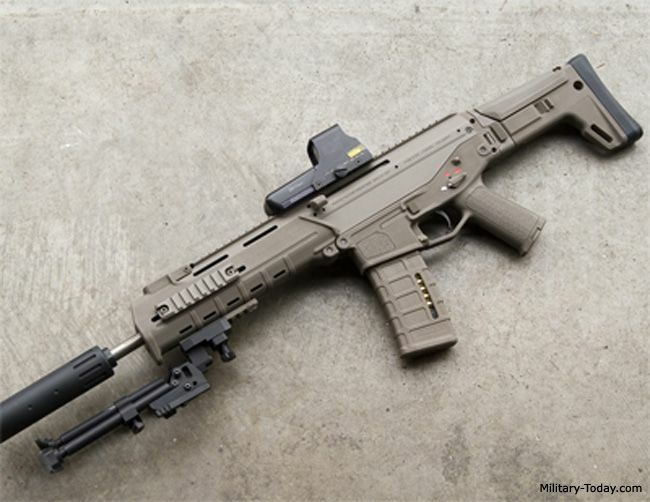 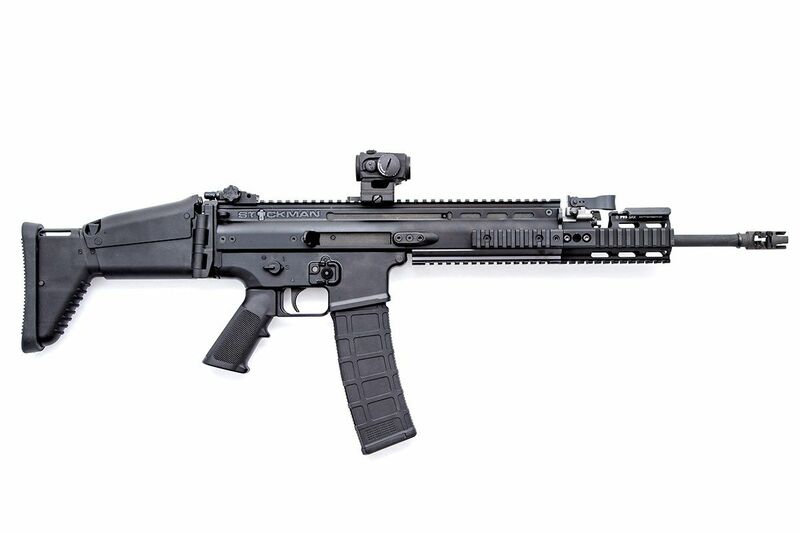 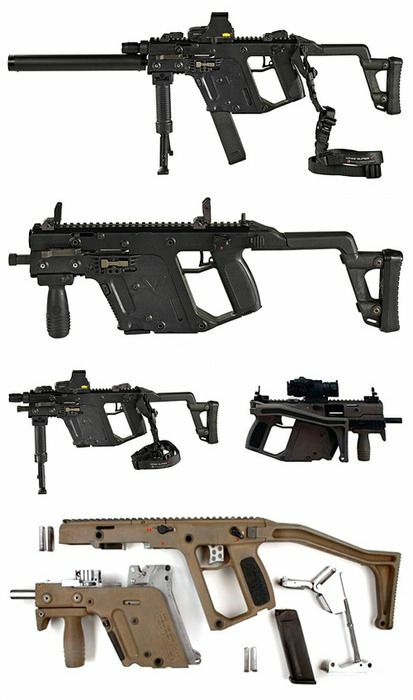 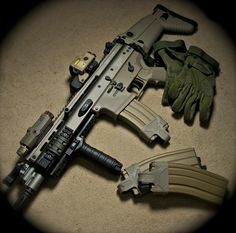 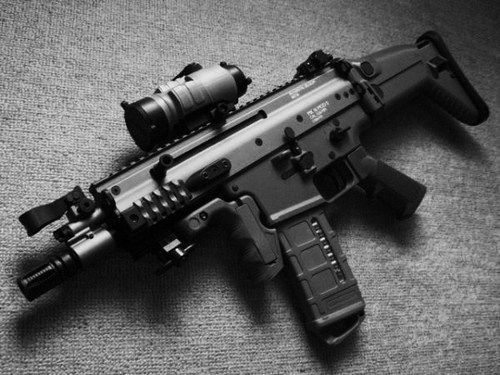 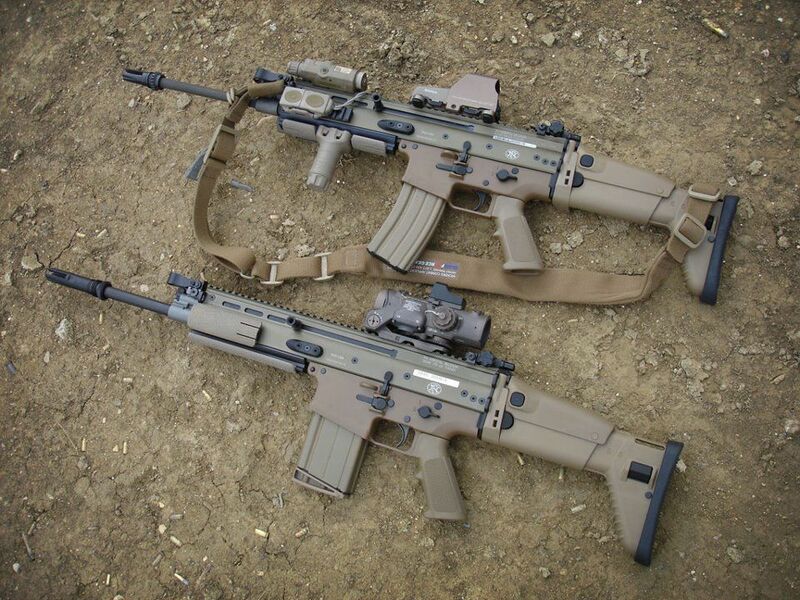 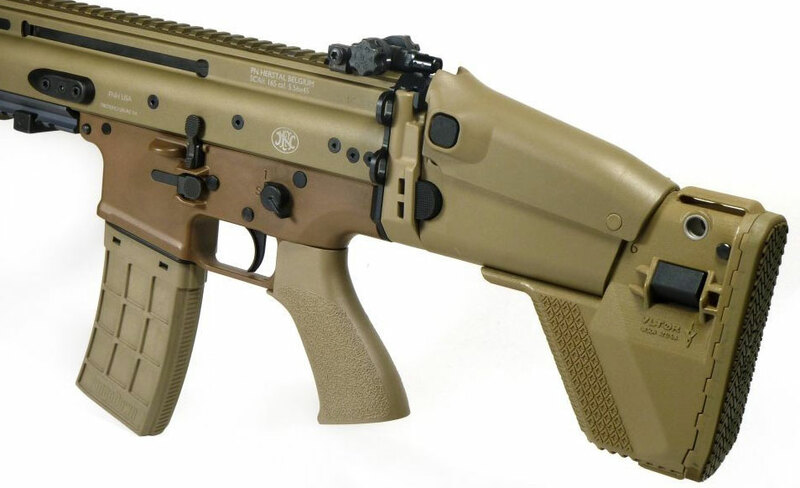 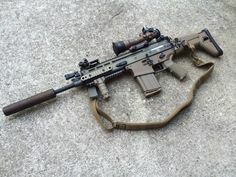 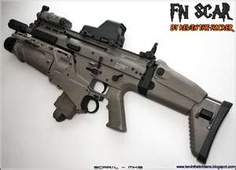 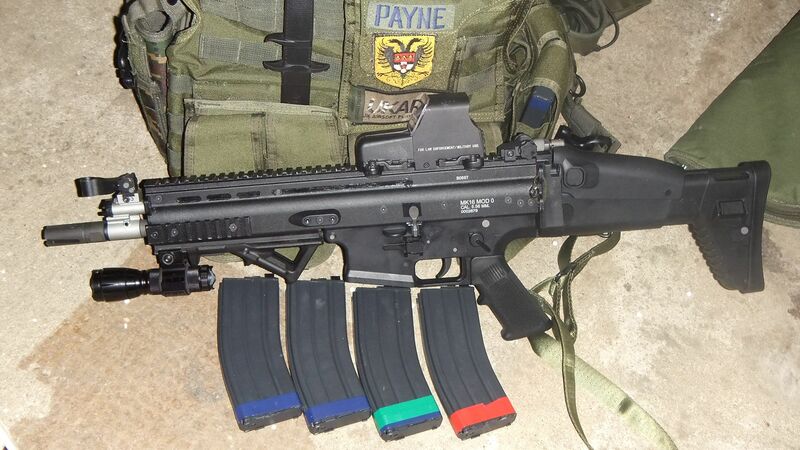 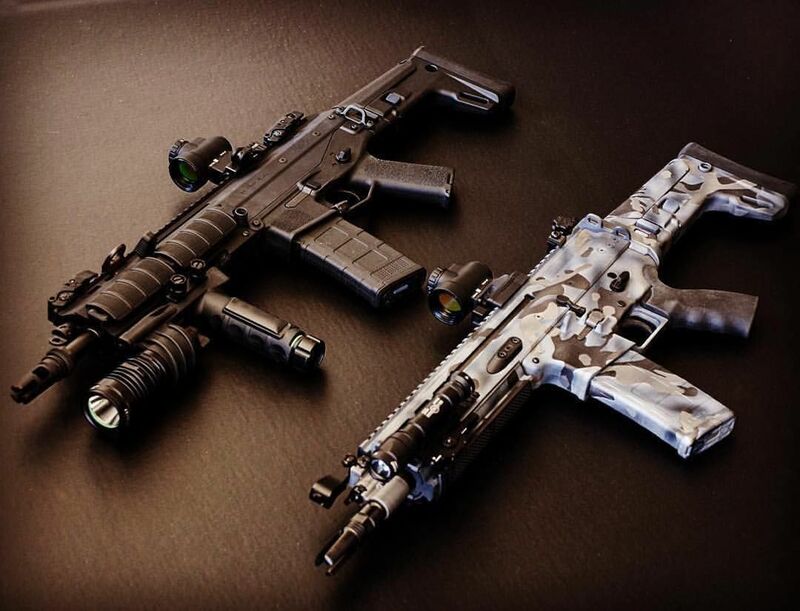 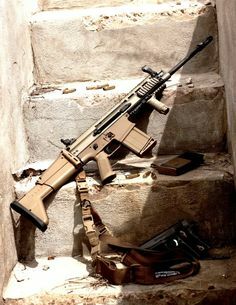 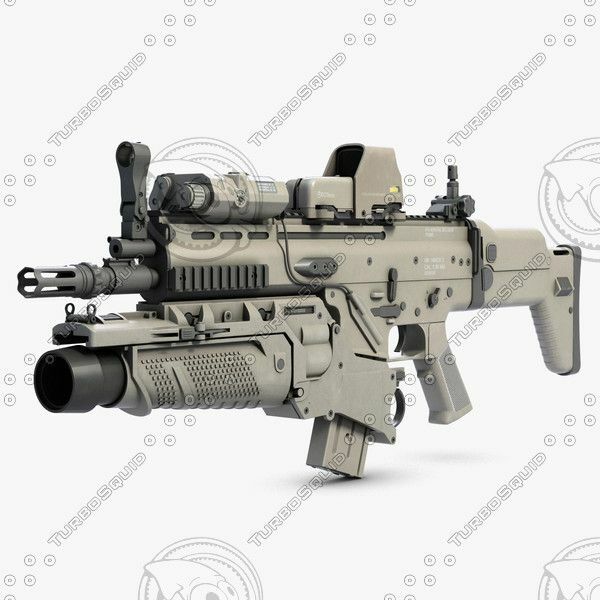 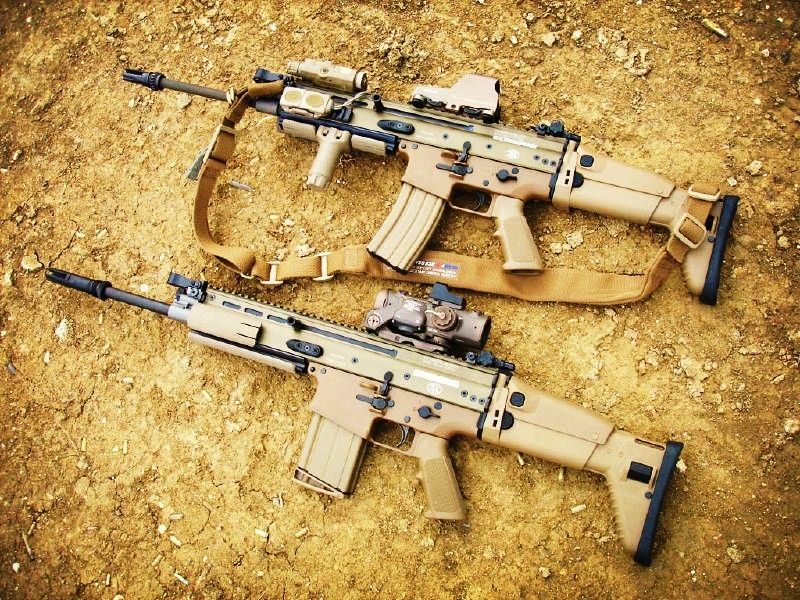 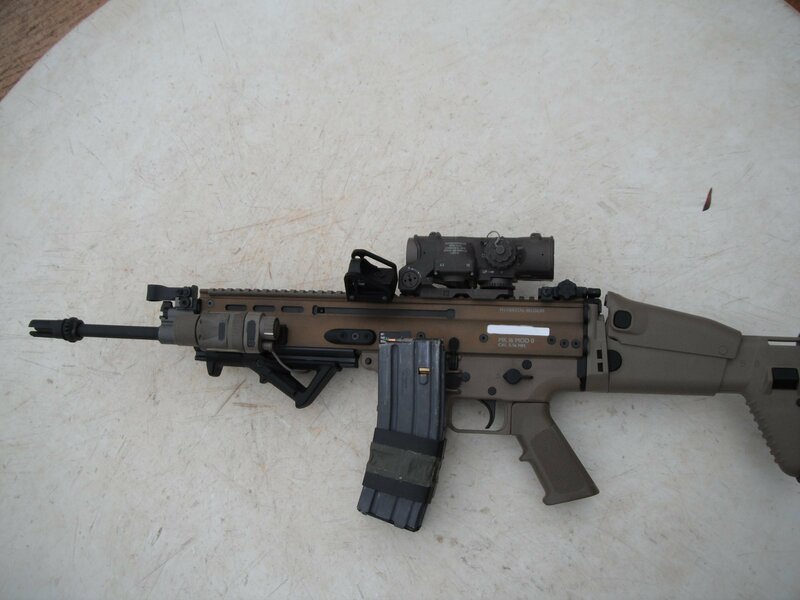 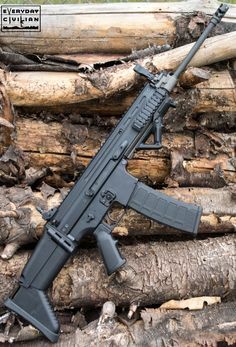 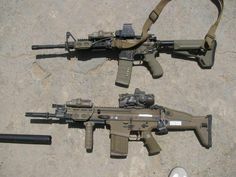 FN Special Operations Forces Combat Assault Rifle, or SCAR. 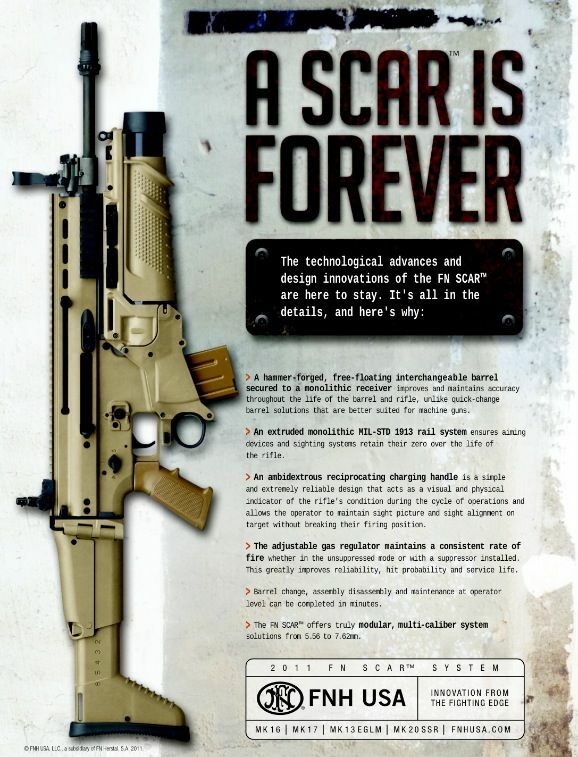 The SCAR-H is the best of its type available right now. Knight's Armament's SR-15 with Elcan Specter Dual-Role sight, PEQ-15 laser aiming module, and 40mm Enhanced Grenade Launching unit. 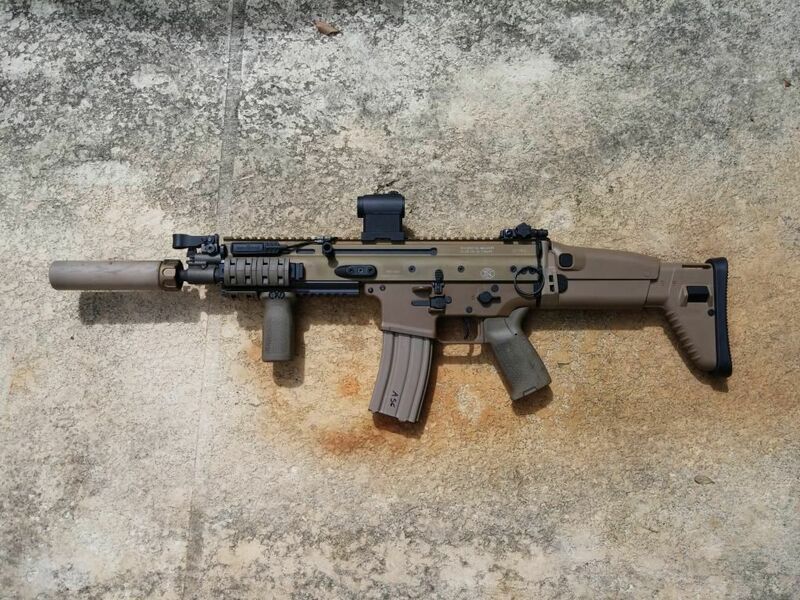 Great setup with carrier, SCAR 17 and Glock in FDE with the threaded barrel. 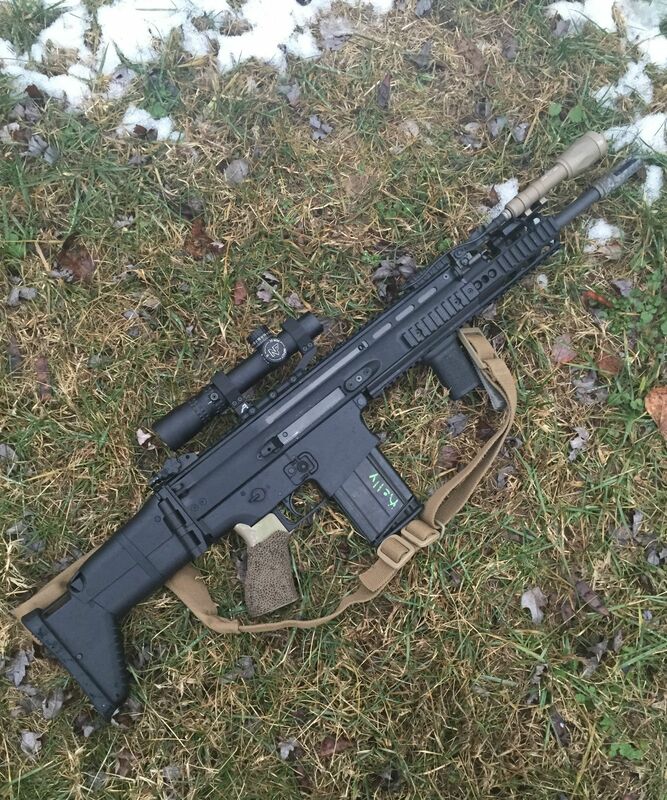 SCAR 16 with Elcan Specter 1-4x, WML, SCAR grip, and Magpod. 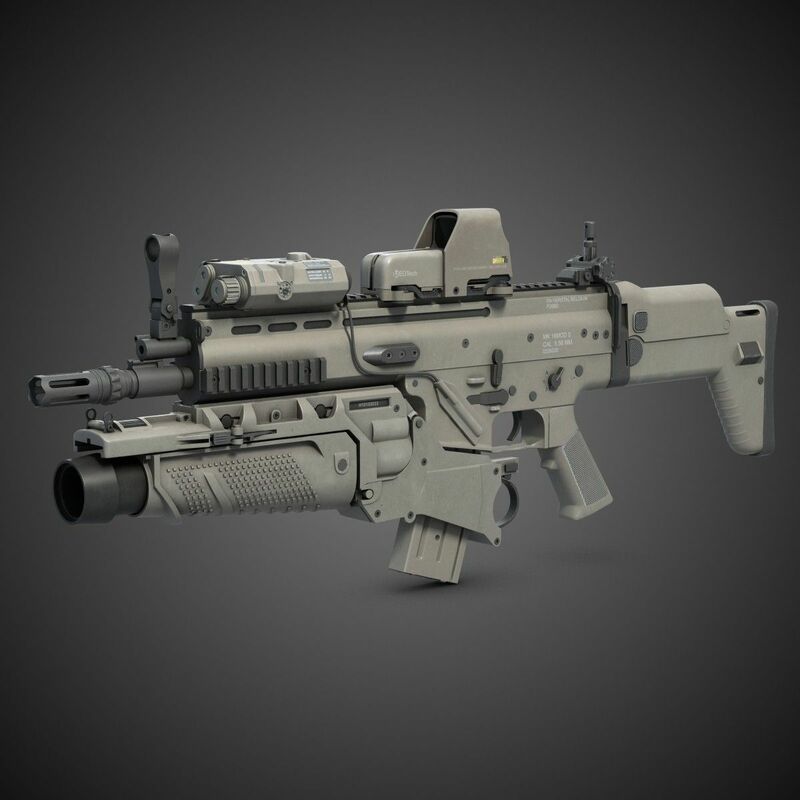 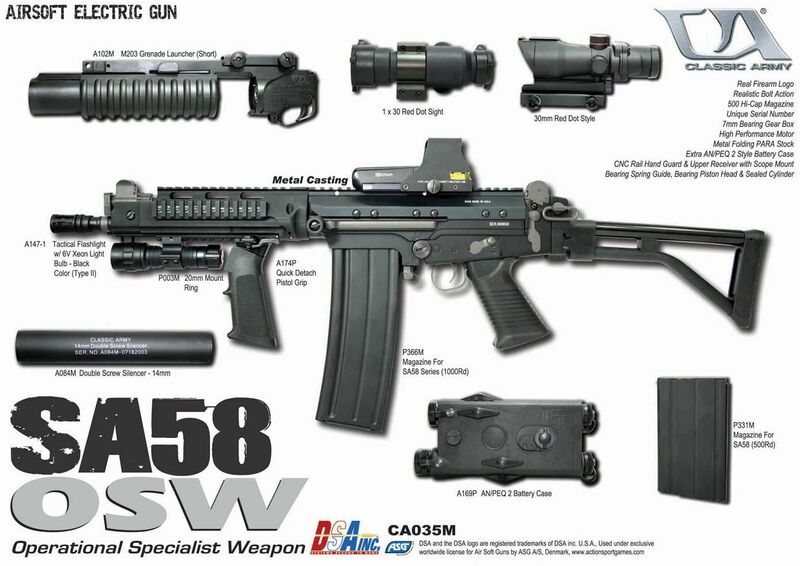 ACR with EOTech holographic sight, suppressor and bipod (folded). 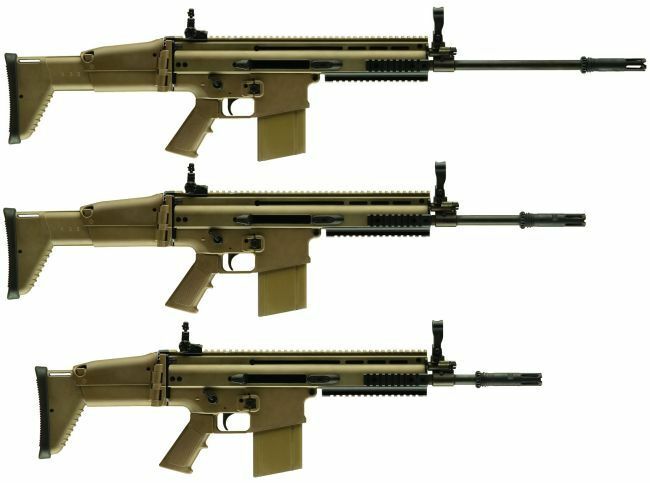 fn scar | Fusil de asalto (FN SCAR) - Taringa! 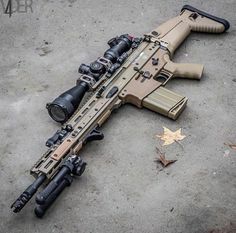 SCAR-H with stock folded, scope sight, vertical foregrip and bipod. 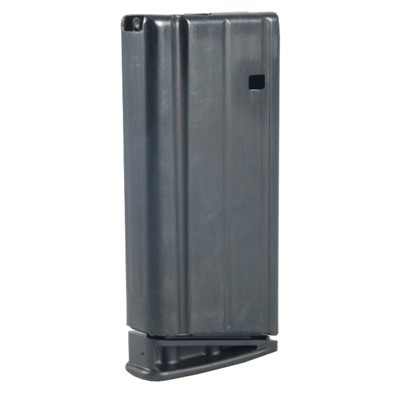 One ammo magazine in plastic wrap and three more still in FN boxes. 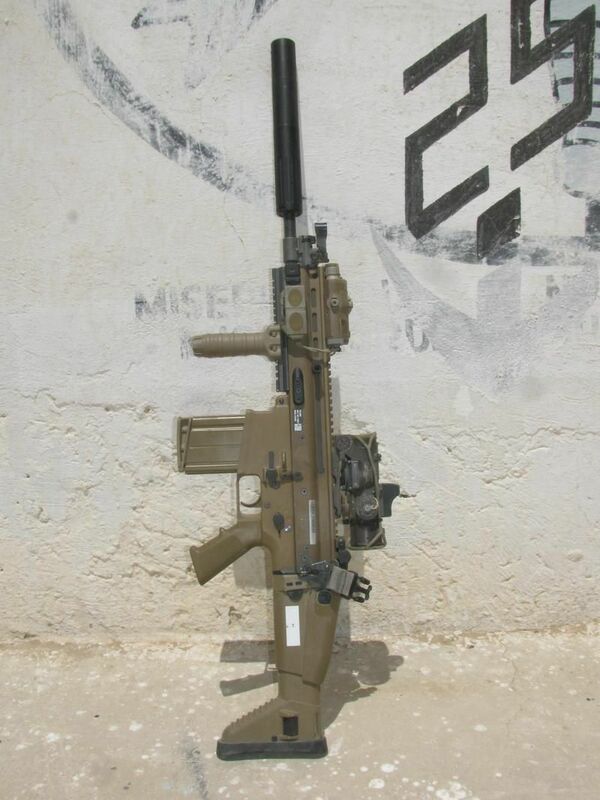 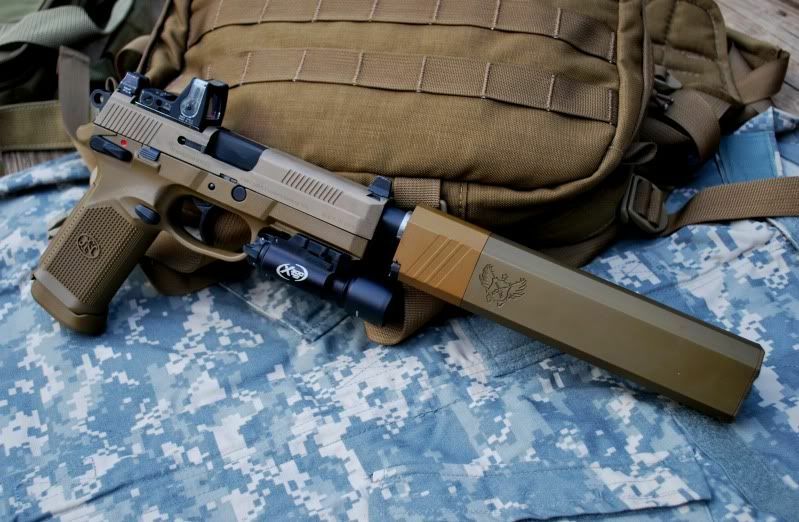 FN .45, trijicon sight and Osprey Silencer. 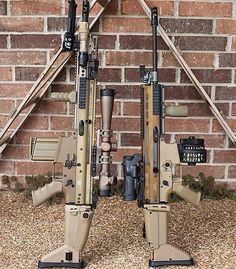 Dangerous combo.